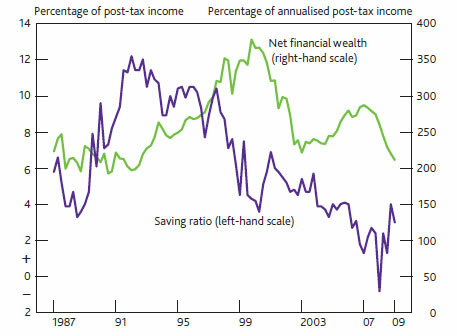 By contrast the average savings ratio in the past 54 years is 9.2% of disposable income. In theory, lower interest rates reduce the incentive to save. But, the interest rate is only one of many factors influencing decisions to save. The most important factor is the state of the economy. 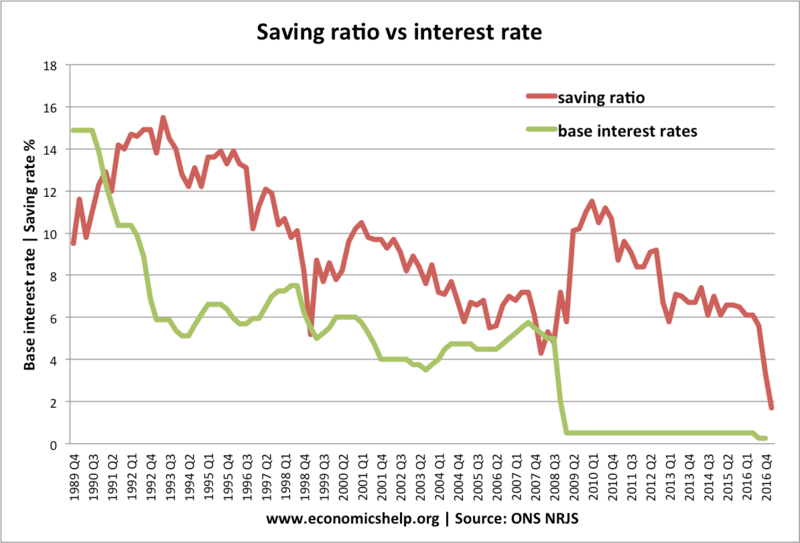 In 2009, we saw a rapid rise in the saving rate because of the recession – despite interest rates cut to zero. This shows total quarterly gross household + non profit savings. 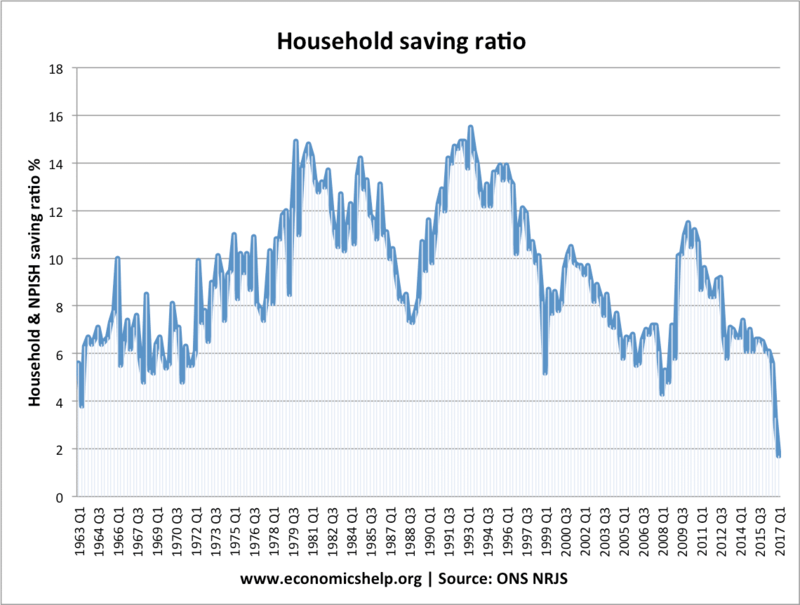 In the post war period, the UK savings ratio was on an upward trend. Between 1964 and the early 1980s, we see a long-term rise. There was a peak in the recession of 1980/81. However, between 1992 and 2008 (in a period known as the great moderation), the saving ratio fell to an all time low of 4.6%. At the start of the credit crunch and recession of 2008-10, the saving ratio rose rapidly as consumers became more risk averse and wanted to pay off debts and increase savings. This rise in the saving ratio contributed to a fall in consumer spending and negative economic growth. 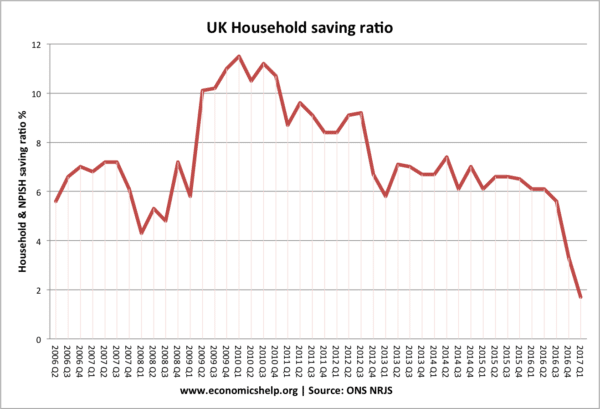 The sharp fall in real GDP in 2008/09 mirrored the sharp rise in the savings ratio. The concern is that economic growth post-2012 is partly driven by a falling saving ratio, that is unsustainable without a rise in real wages. The 2008-12 recession has caused a bigger long term squeeze on real incomes (due to higher tax, rising energy prices and falling real wages). Therefore, people have had less room to increase savings and pay off debt. They have been struggling to meet bills and so they don’t have the same luxury of increasing saving. Since 2010 Q1, the savings ratio has fallen significantly from 11.8% to 4.7% Q2 2015. This is partly due to stagnant real wages, though there are hopes that the recent rise in real incomes will translate into higher savings ratio. Availability of credit until 2007 encouraged people to take out loans. Low-Interest rates. E.g. in 1991-92 interest rates were over 12%. In 2000s interest rates fell to 3%. Interest rates are currently 4.5% and less than inflation. This negative real interest rate discourages saving. Why do saving ratios tend to rise in a recession? In a recession, people worry about unemployment and so are likely to be more cautious about borrowing and spending. If you fear unemployment, you don’t want to be saddled with debt repayments on a new car. People tend to delay big purchases during economic uncertainty. Saving ratios rose during a recession such as 1991-92 and 2008-12. Banks are trying to improve their balance sheets by attracting more deposits and lending less. It is often hard to get a loan during a recession. During 2008-12 real interest rates were often negative which, in theory, reduces the incentive to save. 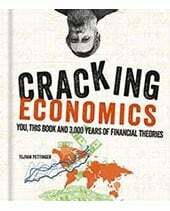 However, low real interest rates can be outweighed by more important factors, such as the fear of being made unemployed. In other words, people are saving more – despite poor return from saving. 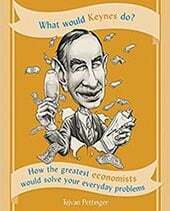 The paradox of thrift is the idea that if everyone saves at once, it can cause macro-economic problems (i.e. recession). From an individual perspective, it makes sense to save and pay off debts in a recession. 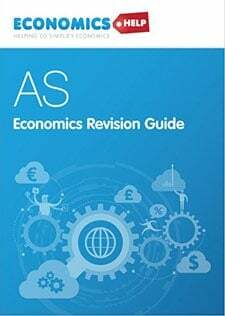 But, if everyone pursues the same course of higher saving, it causes a fall in aggregate demand. 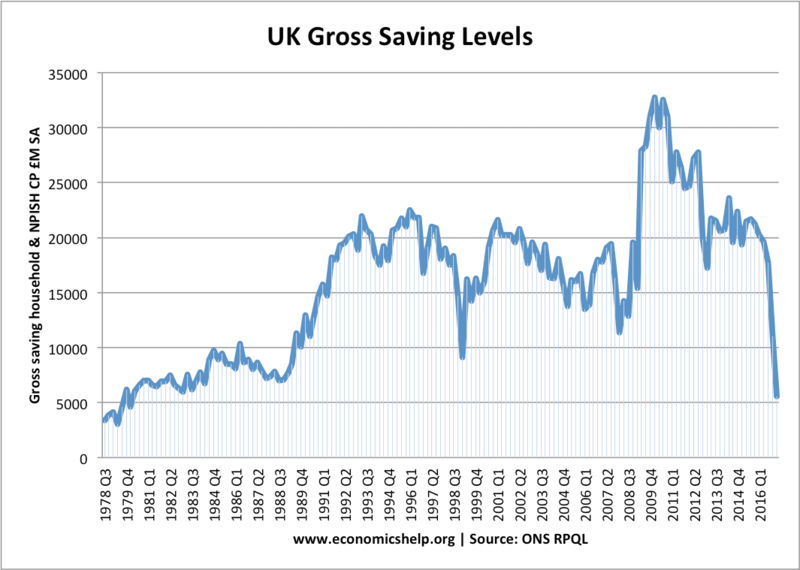 If the saving ratio rises, government spending needs to take the place of private sector spending and investment. Otherwise, the recession will be deeper. If the saving ratio rises, the private sector has more available funds to purchase government bonds. A rapid rise in the savings ratio can cause a fall in aggregate demand and recession. However, in the long term, a higher savings ratio is often considered to help promote more sustainable economic growth. Higher savings enables more private sector investment. Many see this level of investment as a key factor in determining the long term economic growth rate. Unbalanced economy with over-reliance on consumer spending. Build up of personal debt. 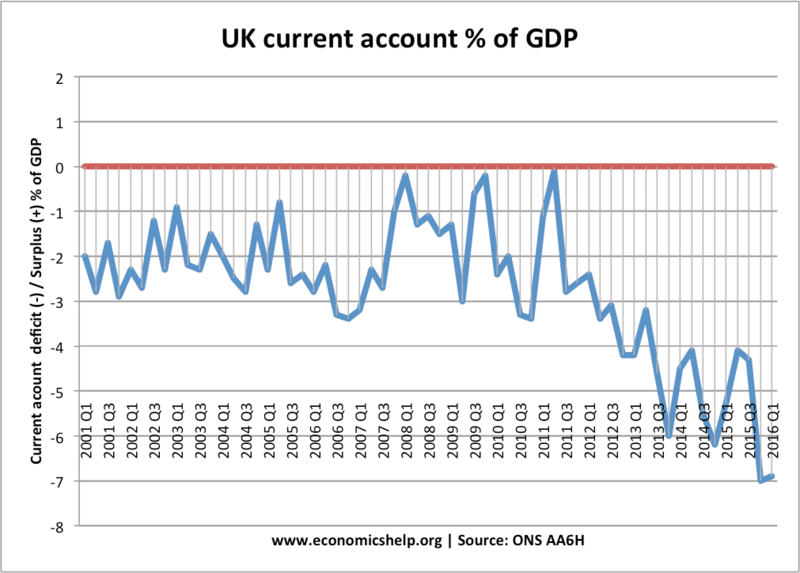 Since 2010, the fall in the savings ratio has occurred during a widening of the current account deficit. 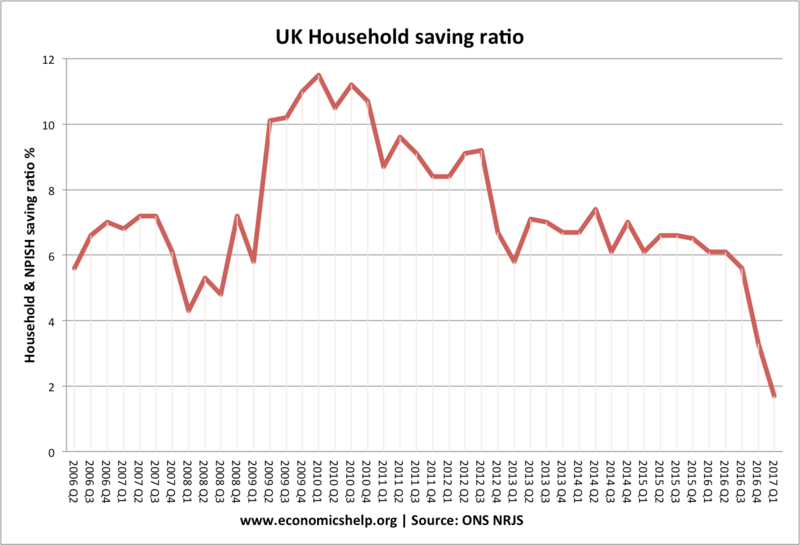 (1) The ONS define the savings ratio (NRJS) – Households’ saving as a percentage of total available households’ resources. (2) The saving ratio is subject to be revised at a later date. 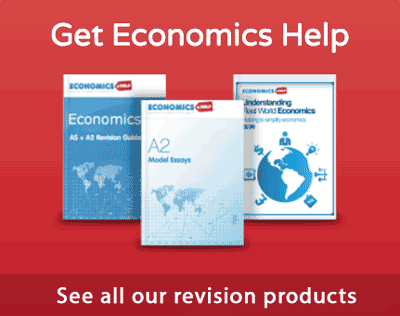 This entry was posted in economics and tagged savings, stats. Bookmark the permalink. Thanks for sharing this article .I get more ideas from this article . It’s pretty obvious that savings rates are being held artificially low. House prices are far too high relative to income and are being propped up with govt subsidies both in rental and purchase terms. The “working poor” are fed up paying taxes to subsidise those who know the system and work less than 16 hours to get enough in benefits to afford themselves a better life than those who work over 35 hours. it is also difficult for those on 16 hrs to transfer from the easy life to working full time – because they will be worse off due of the loss of subsidies. The gravy train has pulled into the station and the govt is blatantly robbing the old of their hard earned pensions. This is not the solution to encourage people to work hard or save money into a pension – those who don’t will be just as well off as those who do, so why bother? Socialism has gone too far and is now penalising those who work. Excellent comment Lynne; I would be hard pushed to put it better myself. To improve the savings ratio in the UK the ever growing attitude of “Live for today, for tomorrow we may die” & “You are worth it”, has to be turned around. 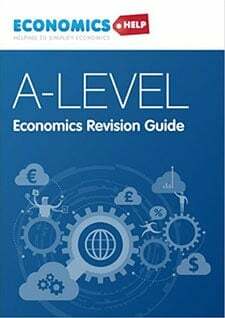 The PR / marketing / advertising machines, need to be countered by sound & simple economic education (without the heavy Keynesian bias), utilising T V documentaries, advertising, internet. 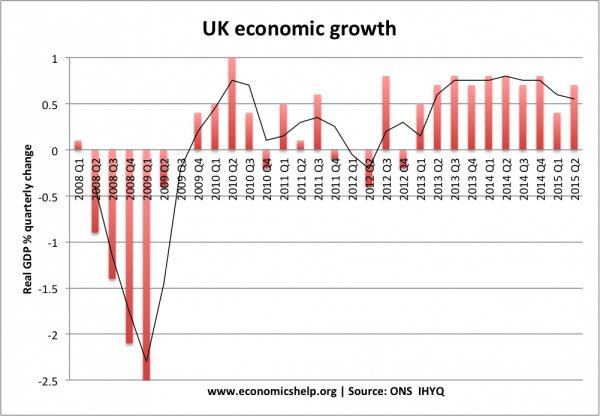 If we don’t do something as a nation, the UK will continue to head into a bottomless economic pit, lacking investment, over-consumption, short-term thinking. The consequence could cause the UK to fall out of first-world category, relative to other nations that have better policies & better aggregate attitudes.